This is my entry for the show “Repurposed: Art from Recycled Materials.” With it, I am trying to expand the idea of repurposing to several levels. I know that I have had this problem in the past. You have fresh road kill and nothing to serve it on. Repurposing road kill into something tasty requires something more than the average plate. Whether its Drive By Deer or Squashed Squirrel Surprise, that’s where the Road Kill Serving Tray comes to the rescue. 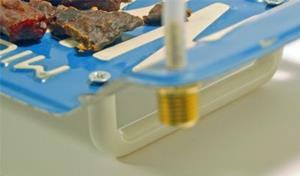 Made from the finest enameled galvanized steel, you will find the surface of the Road Kill Serving Tray able to stand up to the wear and tear that fine dining requires these days. Because Michigan has recently decided that the traditional blue license plate is no longer the distinctive nameplate that Michigan cars require, and considering the abundance of readily available material that is there for the recycling, I propose to turn them into a new “Blue Plate Special” for the tough times living in Michigan. It’s a known fact that the Michigan economy is going through some difficulties, and getting to better times today requires that we think outside the box about our state resources. I want to do my part by bringing together two heretofore untapped categories the state finds itself richly endowed with. But wait, there’s more! Incorporated into each Road Kill Serving Tray set are other parts not “serving” their original purposes too! The feet of the tray are drawer pulls scavenged from other cabinets that I meant to build some day. The beautiful tray handles are made of the finest tubing ever to be used in an icemaker ( I probably should fix that) and the serving utensils are enjoying their second life, having been rescued from the dull world of putty and spackling. The rugged construction will give many years of use. Just think, these plates were designed to stand up to years of exposure in the harsh environment that is the typical Michigan winter. Ok, so we’re not Minnesota. But it is harsh. 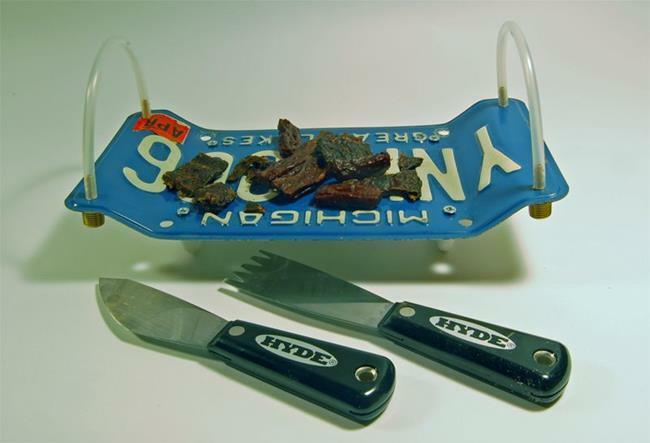 Get the Road Kill Serving Tray today and take repurposing to a whole new level. The Road Kill Serving Tray is made of steel, enamel, brass and plastic. The dimensions are 11 ½” long, 6” wide and 5 1/4 “ tall. 11 ½” x 6” x 5 1/4"